Representatives of the Indian and Russian tourism industries met and have signed an agreement in Saint Petersburg to promote the flow of tourists to each other’s countries. Russia and India have concluded a multilateral agreement on cooperation in tourism, in St. Petersburg. The two countries will help each other raise the flow of travellers to each other’s countries, stated a press release of the Northwest branch of the Russian Union of Travel Industry (RST), sent to Lenta.ru on Wednesday, October 5. The statement said the agreement allows Russia to be promoted in the Indian tourist market, and to jointly hold various events (press tours, exhibitions, road shows) to promote tourism. 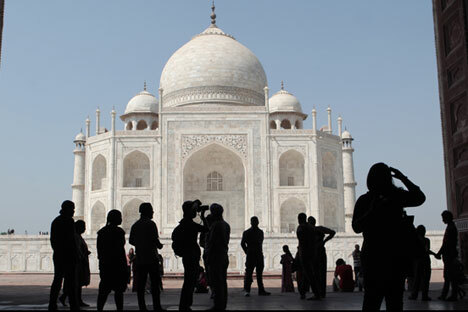 An ‘India Friendly Programme,’ to develop and focus on bringing tourists from India, is an important part of the agreement, said Sergei Korneyev, deputy head of the Federal Tourism Agency. Russia expects a sharp growth in tourist inflow from India shortly. Ekaterina Belyakova, one of the founders of the Russian Information Centre in India, said the organization is considering collaboration with Bollywood to popularize Russia among Indian tourists. "Indians are waiting for a personalized reception and attitude, this category of consumers has its own specific features and characteristics in the organization of tourism trips," noted Korneyev, who feels the ‘India Friendly’ project will help improve the situation. The signing of the agreement was the final stage of a study tour for Russian journalists, and representatives of the tourism industry of several Asian countries. Foreigners visited Moscow, St. Petersburg and the Crimea in late September. Gursahib Sethi, one of the participants in the promotional tour and head of a group of travel agents Sahibji Online, expressed confidence that Russia had much to offer to Indian visitors. "Your country is a whole world in miniature, where there is an amazing, diverse nature and rich cultural heritage, which we appreciate, as well as greater opportunities for business tourism, and cost-effective accommodation", said Sethi. Oleg Safonov, head of the Federal Tourism Agency, suggested in early September that a visa-free regime be organised for groups of travellers from India, as well as those from Vietnam and Iran.